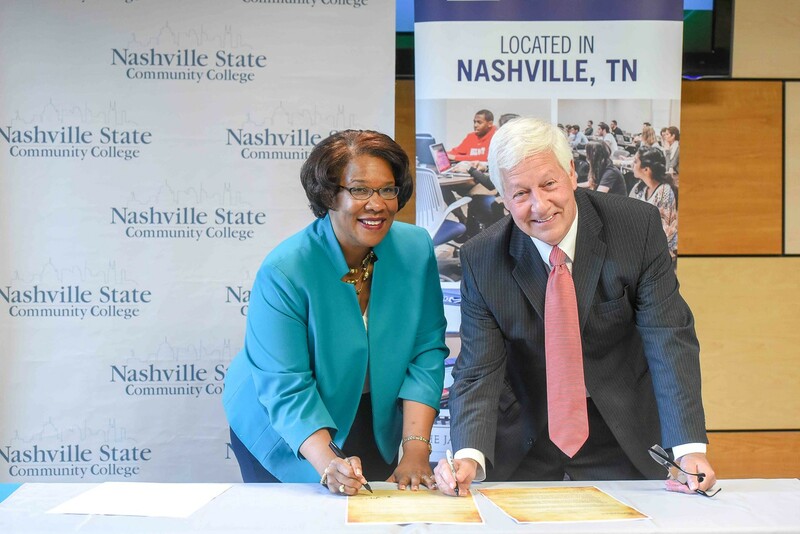 Dr. Shanna Jackson, President, Nashville State Community College and Belmont President Dr. Bob Fisher sign an Articulation Agreement Signing between Belmont University and Nashville State Community College at Nashville State Community College in Nashville, Tennessee, October 31, 2018. Belmont University and Nashville State Community College announced today a new partnership that allows Nashville State associate degree students the opportunity to earn a Bachelor’s of Business Administration (B.B.A.) degree from Belmont’s Jack C. Massey College of Business. Belmont reached a similar agreement with Columbia State Community College this summer. According to a recent article in the Chronicle of Higher Education, 80 percent of students attending community colleges nationwide intend to pursue a bachelor’s degree, but only 14 percent have one six years later. This new agreement—which provides deeper connections between the two programs and streamlines services and admissions for students—aims to improve those numbers in Tennessee. Eligible students must earn a Nashville State Associate Degree in Business Administration by completing the transfer coursework developed and approved by both institutions. Through this agreement, Nashville State students who meet stated requirements can be granted early admittance into Belmont’s Massey College of Business. The degree completion program is open to any Nashville State business student. Students applying for need-based aid or VA benefits as well as adult students seeking reduced tuition options are all eligible for this program. In addition, a transfer scholarship has been created to support students pursuing 2-to-4 year Nashville State/Belmont option. The scholarship, open to graduates of Nashville State’s associates in business degree, has a value of $3,000 per semester for four semesters of continuous study at Belmont. Ranked among the Best Undergraduate Business Schools by Bloomberg BusinessWeek, Belmont’s Jack C. Massey College of Business offers the highest quality of business education in a Christian environment. Belmont is the only private university in Tennessee to have met the quality standards to achieve business and specialized accounting accreditation by AACSB International — The Association to Advance Collegiate Schools of Business. This dual accreditation places Belmont among the less than one percent of the world’s business schools to achieve both business and accounting accreditation.